Recent news reports sited a medical study on the increased risk of heart attacks associated with taking calcium supplements. It was not a small group of test subjects. 24,000 people, both men and women. People who took the supplements on a regular basis were 86% more likely to have a heart attack than those that did not. People who used supplements as their "only" source of calcium had a 139% increase in their likelihood of a heart attack. 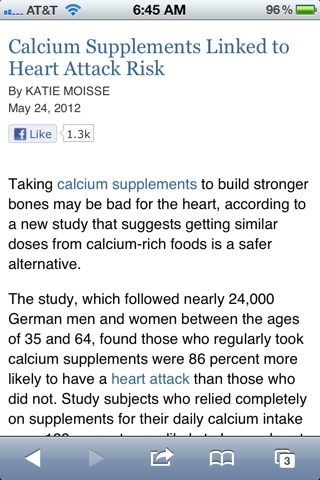 Does this mean our bones should just be allowed to disintegrate? As farmers, we know their are other options. As people who love to cook we know there are delicious alternatives. When we deliver a chicken, there is always the option of feet and livers with it. A stock made from the chicken carcass, along with the feet, carrots, celery, onions, salt and pepper and water to cover, set to simmer on the stove for an hour or so, then poured through a colander and into a bowl, will produce a tasty stock full of calcium and other goodies. Substitute for any time water is used...in making rice or a gravy from the stock, a little butter and flour in the bottom of a skillet. Or take the stock and use it to simmer another whole chicken in it, allow the chicken to cool, pull all the meat off, put it back in the pot, and add something else that we grow: greens of any kind. Along with any other vegetable you live, an easy, one pot meal that will be certain to taste great. And increase your calcium. Those dark leafy greens: kale, collards, spinach, turnip greens, mustard, tatsoi, Swiss chard, beet greens...and more...have calcium available when eaten.